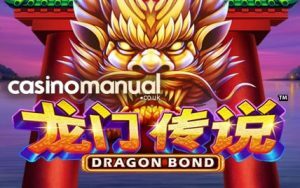 Dragon Bond is a simple but potentially exciting Asian-themed video slot from Playtech. It’s a 6 reel, 50 payline game that comes with a free spins round with extra stacks of wilds. Land 2 wilds on the same row and the symbols in between turn wild too. You can also win a jackpot of 500 times your bet. Play on your tablet, mobile or computer from between 10p and £500 per spin. There’s a simple, understated look to Dragon Bond. Set against a tranquil riverside backdrop, the reels are set within a pagoda-style building. Joining the A to 9 royals are butterflies, lotus flowers, frogs and turtles. The best of the standard symbols is the icon with the pair of goldfish. Land 6 of these for a payout of just 2 times your bet. coins. Not huge numbers but there are opportunities to create some big winning clusters, more of which shortly. The roaring dragon head is the wild. This replaces all other symbols bar the scatter and pays up to 2 times your bet. The dragon is central to one of the main extras on offer in Dragon Bond. Wild Connect feature – if you manage to land 2 wilds on the same row, then all the symbols in between them also turn wild. For example, if you land wilds on the same row on reels 1 and 6 the symbols in between on reels 2, 3, 4 and 5 also turn wild. Free Games feature – land 3, 4, 5 or 6 of the scatter and you’ll receive 10, 15, 25 or 50 free spins. Extra stacks of dragons are added to reel 6 so you can expect to see the Wild Connect feature come into play much more regularly in the feature than in the base game. There’s also 1 retrigger available meaning 100 free spins in total potentially. Dragon Bonus feature – fill all of the 24 reel positions with dragon wilds (via the Wild Connect feature) to trigger this bonus and with it a payout of 500 times your bet. Dragon Bond is a straightforward but very playable game. The features can deliver some cracking action, especially in the Free Games feature where the extra wilds and the regularly hitting Wild Connect feature can really come into its own. The Asian-theme remains every popular. Dragon Bond is a basic but enjoyable take on this classic theme. Playtech offers much more appealing video slots though with Legend of the Jaguar and the movie-inspired The Matrix recommended.